As happens more and more today, my husband strikes up a conversation with an individual about a tattoo. In fact, Mark has garnered a reputation for noticing anyone with interesting tattoos, and asking them what their ink means and why they picked that particular symbol to put on their body. It actually became a joke between me and my nephew, who has tattoos himself (depicting Bible verses and various associations to his faith; and one for his mom, of course!) -- whenever we were all together and ran into a waitress or waiter, or someone out in public, we would look at each other, waiting expectantly for that question ... "So, what does your tattoo mean"? But this particular day, Mark didn't need to ask the couple behind us in the checkout line. 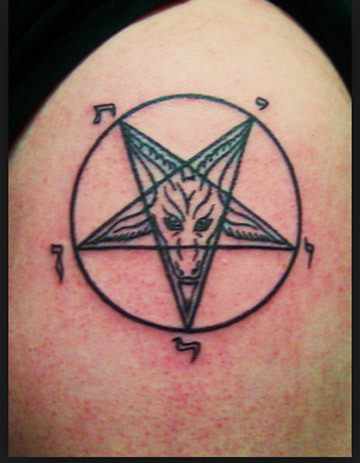 The man had a huge encircled pentagram on his bicep, among other occultic symbols, and the woman had creepy bats flying up the length of her arm. We didn't need to wonder what kind of statement they were trying to make; it was obvious. Now, I know that tattoos are the rage today among anyone below the age of 35, and you may think they are just a fad, or this generation's nod to distinguishing themselves from their parents -- kind of like long hair, miniskirts, tie-dye T-shirts, and love beads were to my generation. But I think it goes beyond that... for the most part, tattoos are permanent statements that people are willing to make for the rest of their lives. And I would venture that most of them are designed as a method of rebelling against authority and control in their lives; or at least of going against conventional society. (The problem is, so many are doing it today, that in an effort to distinguish themselves from others, they are beginning to all look alike). But, perhaps at the heart of this trend, it's a way of saying, "I don't feel like I can control a lot in my life at the moment, but I can control how I feel; and express who or what I am willing to give authority to by the indelible design I put on my body. It's a way I can make a statement of who I am and how I want the world to see me". I am not making a statement that all tattoos are done out of a sense of insubordination, disobedience, or defiance. In fact, we have heard heartwarming stories, such as when a waitress shared the reason behind a small tattoo on her wrist -- it was a personal reminder of her grandmother who had taught her about Jesus. Or the young man who had the date of his twin brother's death in a car crash tattooed on his forearm. We often hear stories that honor our humanity and the love that can exist between people. I found it quite interesting when I ran across the Top Ten reasons people get tattooed in Inked Magazine: In memory of someone; some really love the pain; it's addictive; to express creativity; to feel whole; to overcome or represent obstacles they've faced in their lives; they simply love the art; to spread a specific message; it's trendy; to be spontaneous. Some of these reasons seem innocuous; others are a little more disturbing. But sadly, there are an abundance of kids who carry permanent symbols of pagan gods, anti-christ icons, and undisguised associations with the devil. The man with the huge pentagram knew exactly what he was doing when he had that mark put on his body. In fact, some of the kids my husband has approached with his innocent question have boldly told him, "It means I am a satanist". The pride with which that statement was made both saddened and alarmed us. So, as with anything, when pride and rebellion are combined, we see the influence of the original Rebellious One, himself ... Lucifer. And, in case you haven't noticed, the symbol of the encircled pentagram is becoming a popular emblem; appearing in movies, TV, tattoos, jewelry, music videos, horror films, thrillers, and crime dramas ... all reinforcing the symbol’s association with neo-paganism, black magic, and occultism. As explained on GotQuestions.org, a Christian website, the pentagram has been used as a religious symbol throughout the world from the beginning of recorded history. The most basic pentagram is simply a five-point star drawn with one continuous line broken into five line segments and with one point of the star facing up. The pentagram was used in ancient Chinese and Japanese religions to symbolize the five elements of life. In Japanese culture the symbol was also considered magical. Ancient Babylonian culture was also using the pentagram to represent various gods and religious beliefs of their own. But would it surprise you to know that the pentagram was also a part of early Christian symbology? The basic pentagram (without a circle) was originally used to represent the five wounds of Jesus Christ. It was soon supplanted by the symbol of the cross, but the pentagram was still recognizable as a Christian symbol for a few hundred years after Jesus’ resurrection. Some say that the continuous line was also considered symbolic of the Alpha and Omega. Plus, it is important to note that, during the European Age of Enlightenment, the ancient Greek mathematician Pythagoras’ interest in the pentagram was re-discovered. Pythagoras’ study went beyond mathematics, though, as he assigned the five ancient elements to the five points of the star: earth, water, air, and fire on the four lower points; and spirit on the topmost point. Depending on the mythology, this arrangement usually indicated the correct ordering of the world, with material things subject to spirit. The popularity of this ancient symbol has continued down through the centuries with the Freemasons (who glorify Baphomet) and the Eastern Star Organization also using this Pythagorean pentagram, often adding their own symbols as well. And now, in this modern era, it's relevancy ranges from being a fashion statement to a symbol of rebellion against the authority of Jesus ... and everything in-between. There is another angle that I want to explore, too. It is my opinion that Lucifer, being perfect in his beauty and ways "since the day he was created" (Ezekiel 28:15), and being puffed up with pride at his station and importance in the Kingdom of Heaven, simply could not stand being Number Two to God/Jesus. His wisdom became corrupted by his free will, and out of selfish ambition and pride, he decided to rebel and issued his five "I will's", which I think are represented by the five-pointed star of the pentagram: ""I will ascend into heaven, I will exalt my throne above the stars of God: I will sit also upon the mount of the congregation, in the sides of the north: I will ascend above the heights of the clouds; I will be like the most High" (Isaiah 14:12-14). The fact that the pentagram has been incorporated into the symbolism of modern "religions" such as Wicca, Witchcraft, and The Church of Satan are evidence (in my opinion) that Lucifer, as Prince and controller of this world, is making sure that his ancient declarations remain in play, whether the followers of these religions realize they are mimicking his rebellion against God, or not. These religions will tell you that they make a distinction between whether the pentagram is inverted or upright -- distinguishing between good and evil intent -- but make no mistake; this symbol represents the god of this world and his fingerprints are all over the pentagram, no matter which way it is pointed. So, when someone sports a circled pentagram tattoo and tells you that it is a passive form "implying spiritual containment of the magic circle, in keeping with the traditional secrecy of witchcraft, and the personal, individual nature of the pagan religious path, and of its non-proselytizing character" ... you can bet that satan is using it to send a subliminal and spiritual message to everyone who wears it or looks upon it ... I still believe that I will be like the most High! Although, as a Christian, you may think that this symbol will never become acceptable to believers of Jesus Christ, but I found numerous websites -- even the Christian GotQuestions.org -- who say there is nothing to fear. They say, "Of course, there’s nothing wrong with a star, and the pentagram itself contains no inherent power. It has been used in many ways by many different cultures, including Christianity. It should not be feared in and of itself, although we should be aware of what other people are communicating through it." I would like to dispute that claim! It does contain power! The power of demonic suggestions and lies; coming down through centuries of use by those in rebellion to the One True God. And we are seeing that today ... Wicca is America's fastest growing religion, and it is anticipated by some Christian religious experts that it will become the third largest religion in the United State in this century, behind only Christianity and Islam. 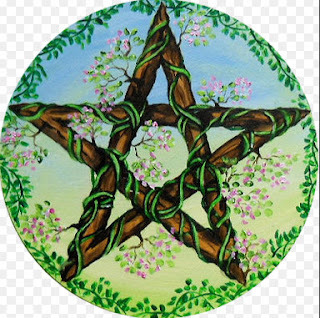 And the pentagram (or pentacle) plays a major role in the symbolism of this pagan religion. Finally, the deception of satan is clearly understood in the following statement from the paganspath.com website: "As society becomes more informed and misconceptions become corrected, all pagans hope these old stereotypes will fall by the wayside and acceptance will be granted to everyone regardless of their beliefs." That just sounds like the Church will be pressured to compromise, and to accept the concept of "universalism" (acceptance and unity among all the world's religions). We are already well on the way to this compromise! I guess I just don't get it ... no one wants to give any credence to the ancient meanings and significance of religious symbols and traditions. It's all about "what it means to me today" -- yet all these new religions are willing to accept and assign spiritual power to their "new" philosophies, without recognizing that the same ancient spiritual associations are bound to those symbols and are now being perpetuated in their rituals. So don't be surprised when you see someone wearing a pentagram necklace or a small tattoo on their wrist, and they have no idea that they are communicating and representing the ongoing rebellion of the enemy of God. This is why it is so important for us to stay informed and cognizant of the devil's schemes and strategies ... to stay on guard against his deceptive messages. It is not OK to overlook the Luciferian connotations of the pentagram; and it is not OK for Christians to dismiss the implications of satan's power, or to be ignorant of his devices and schemes. As the Word of God says, "we are to give no opportunity to the devil". And it has never more important to recognize that God's people "perish for the lack of knowledge". Our next generations are being tempted by our complacency and indifference.... let us not fail them! John 8:44 "You are of your father the devil, and it is your will to practice the desires [which are characteristic] of your father. He was a murderer from the beginning, and does not stand in the truth because there is no truth in him. When he lies, he speaks what is natural to him, for he is a liar and the father of lies and half-truths."